Mfonsio Udofia in The Homecoming Queen. Photo by Ahron R. Foster. BOTTOM LINE: After fifteen years, thriving New York author Kelechi returns home to Nigeria to aid her waning father—and face the music of her storied past. Kelechi Ekejuba has outgrown her former home of Mbaise. 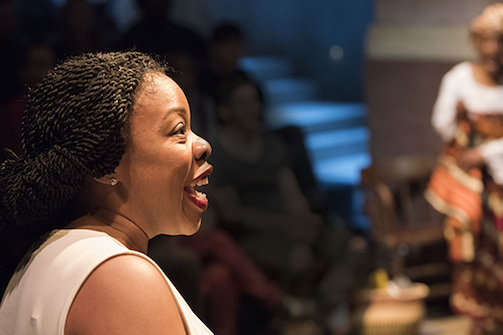 Playwright Ngozi Anyanwu makes these discrepancies between the modern Kelechi and her other-worldly home stark in contrast in the first moments of The Homecoming Queen. The stage is alive with song and color as the townswomen sing and go about their daily routines when Kelechi (Mfoniso Udofia), now a celebrated author, returns to the village in corporate slacks and a blouse, prompting the women to prod at her with great fascination. She stands out as though a foreigner, constantly inviting her father’s qualms to be aired. As the days of her visit pass, Kelechi quickly changes from a charismatic career woman into a girl who is tortured by her past, struggling to articulate any thoughts at all. Filled with regret and longing, Kelechi and her father (Oberon K.A. Adjepong) have a number of demons to face as the delicate relationships of Anyanwu’s play are unpacked. Plays are often described as falling into one of two categories: a person comes to town, or a person leaves home. The Homecoming Queen, in fulfilling both of these tropes, starts out clichéd, but the piece swells in rich moments of music and feeling expertly executed by the cast of storytellers. Mirirai Sithole delivers a captivating performance as Beatrice, the house girl who tends to Kelechi and her father. Sithole's power as an actor cuts through her curious character and plays significantly to the strengths of Mfoniso Udofia in truly challenging scenes. Udofia creates a delightfully anxious emotional arc for our titular homecoming queen, no doubt built upon her lengthy background as a storyteller and educator. If her reactions are a bit predictable at first, she breaks through into a stunning performance when she allows Kelechi's deepest depths to be seen. In a truly touching moment, childhood friend Obina (Segun Akande) places his hands on her heart, and Udofia breaks into a cry that is cathartic for both the character of Kelechi and the critical audience member: at last the piece has pushed into territory that is truly stage worthy. Once the exposition has cleared, The Homecoming Queen finally comes to life with delicious surprises and understated character work. Yet it is the talent of the collective ensemble that is superior here. The chorus of village women, as portrayed by Ebbe Bassey, Vinie Burrows, Patrice Johnson, and Zenzi Williams, performs original music by Amatus Karim-Li that brings the play and all of its intricacies to life. The music is used in celebration, in sadness, in the routine joy of doing laundry, and in every experience in between. What is most important to praise is that there is truly no small part in The Homecoming Queen; the ensemble brings to life something that featured actors could never do, filling the transitions between scenes with all the flavors of Mbaise that can't be woven into the standout scenic design. By the end of its 105 minutes,The Homecoming Queen becomes a play for every actor on the stage and for every patron in the house. The Homecoming Queen is by Ngozi Anyanwu. Directed by Awoye Timpo. Scenic Design by Yu-Hsusan Chen. Costume design by Ntokozo Fuzunina Kunene. Lighting design by Oona Curley. Sound and original compositions by Amatus Karim-Ali. Music direction by Hope Boykin. Dialect coach Ebbe Bassey. Production Stage Manager is Gwendolyn M. Gilliam. Assistant Stage Manager is Joanna Muhlfelder. The cast is Oberon K.A. Adjepong, Segun Akande, Ebbe Bassey, Vinie Burrows, Patrice Johnson, Mirirai Sithole, Mfonsio Udofia, and Zenzi Williams.